You probably won’t shoot your eye out if you don’t sample one of these A Christmas Story leg lamp cookies, but we do think you’ll be pretty peeved if you don’t give the recipe a try, especially because Delish has generously provided a step-by-step video of how to make these luscious, leggy treats. As fans of the classic holiday film know, Ralphie from A Christmas Story was obsessed with these fishnet-wearing twigs, but he’d probably trade in his prized Red Ryder BB gun for a plate of the seductive treats. Seriously, if baking these cookies for Santa still earns you a lump of coal, then there’s no holiday hope for humanity. 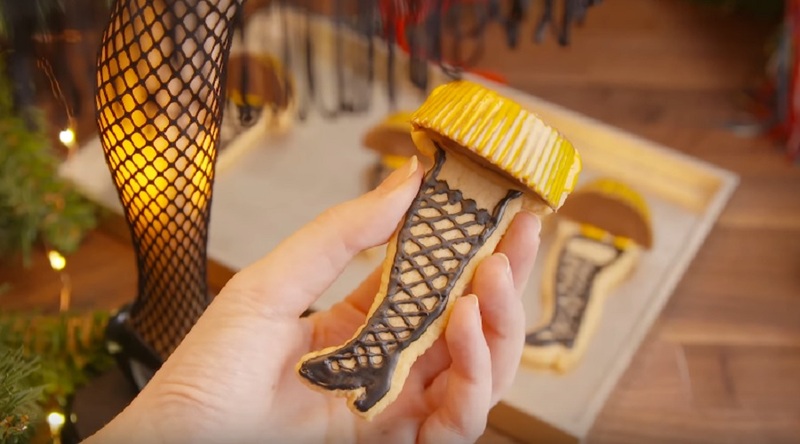 They’re probably a bit ambitious for someone who doesn’t bake regularly or have a steady hand, but the end product is so cute, we totally wouldn’t judge if the fishnet stocking design wasn’t just perfect. Who knew a tube of cookie dough, flour, black cookie icing, Reese’s Big Cups and two jars of peanut butter could recreate one of the most hilarious holiday movie scenes in food form? If anyone wants to join us in baking a batch of these cookies, we’ll bring the Ovaltine.